From multiple firsthand accounts we hear of these officers going outside of necessity, outside of decency, and even going outside of the law for the sake of the pipeline project which according to the National Lawyers Guild, has no basis in constitutional law. These acting officers carry heavy artillery and use excessive force in order to face peaceful and unarmed Natives defending their own land. As this ordeal has progressed, it has gradually revealed itself to be the typical situation of official corruption where police abandon the American Constitution for the sake of corporate interests. According to multiple victims, these officers have no issue abusing these people for nothing more than their own amusement. These along with multiple other instances of abusive and violent law enforcement reveal that at times, not even hate crimes are considered illegal when they are committed by those in uniform. Personally, if I were a police officer in this country, and I had to wear the same uniform as those who freely committed crimes in plain sight like so many American police have become known to do, I would be ashamed. My shame would stem from swearing an oath to protect and serve, and then remaining silent when others who took that same oath treated that oath like a joke. 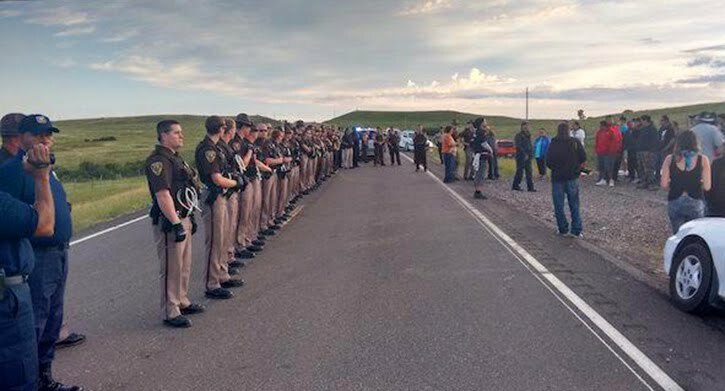 If I were one of these officers at Standing Rock, I would be ashamed because I would realize that my duty included defending the innocent, and that due to my own failure I let the innocent down for the sake of the corrupted banks and the crooked officers standing next to me. I realize that when it comes to doing the right thing, there is risk and uncertainty. The officer who has the ability to tell the difference between duty and fraternal expectation to conform may still have hope. However, those who perpetrate and enable criminal behavior among their own ranks have already lost their honor, as well as the respect of others. When the time comes, those who could not see this difference may be punished along with the corrupt.